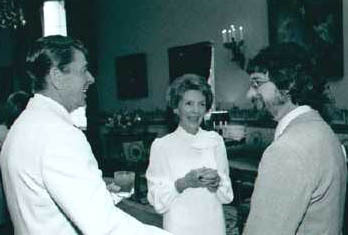 President Ronald Reagan on left, wife Nancy, and on right, E.T. film director, Steven Spielberg, at White House screening in 1982. Photograph from Ronald Reagan Presidential Library, Simi Valley, California. Previous PostPrevious Part 1 – What Does NASA Know About 1965 Aerial Vehicle Crash in Kecksburg, Pennsylvania? Next PostNext Fifth Intense Solar X-Flare – What’s Happening On the Sun?